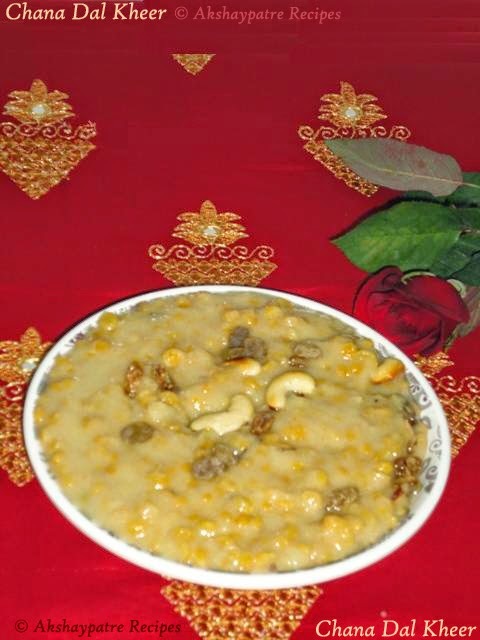 Kadle bele payasa or chane daali paays recipe - Kadle bele payasa is a kheer prepared with split bengal gram, jaggery, and coconut milk. 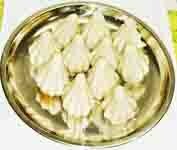 Most of the time during festival I make chana dal kheer to offer God as Naivedya. You can also use moong dal or split green grams instead of chana dal to make such payasa. This is similar to muga dali paays which is traditional authentic cuisine of Karnataka. Split bengal grams or chana dal is the basic ingredients and you can thicken the payasa either with rava or rice flour paste. This is a sweet dish which is extremely pleasing to the sense of taste. Try this payasa to treat your family, friends and relatives. Grind the grated fresh coconut through a mixer using water and extract 2 cups of coconut milk. Roast the chana dal in a tsp of ghee until aromatic. Cook this chana dal in a pressure cooker using water for 3 whistles. When the pressure releases, remove the boiled chana dal and add jaggery to it. Add the coconut milk and mix well till the jaggery melts. Keep this vessel over a medium flame and bring it to boil. Mix the roasted rava in 2 tbsps of water. Adding water is to avoid the lump formation. Add this rava water mixture to the kheer. Stir continuously till the kheer thickens. 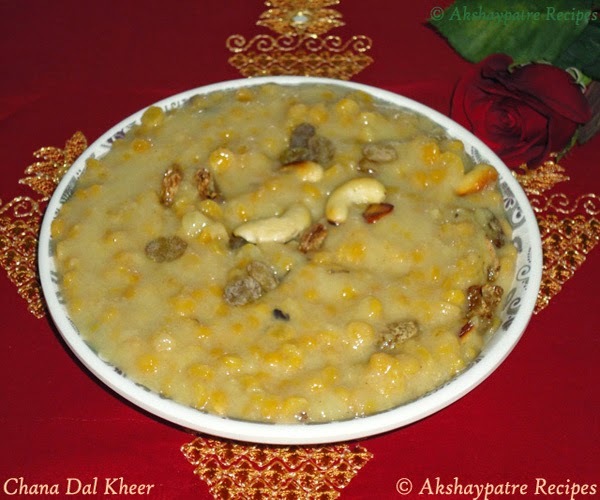 Further simmer till you get the desired consistency of the kheer. I prefer thick consistency and therefore I have simmered it. Garnish with cashews and raisins. Serve the kadle bele payasa or chane daali paays cold or warm. You can replace the chana dal by moong dal. 1. Roast the chana dal in a tsp of ghee until aromatic. 2. Cook this chana dal in a pressure cooker using water for 3 whistles. 3. When the pressure releases, remove the boiled chana dal and add jaggery to it. 4. Add the coconut milk and mix well till the jaggery melts. 5. Place this vessel over a medium flame and bring it to boil. Stir continuously till the kheer thickens. 6. Further simmer till you get the desired consistency of the kheer. I prefer thick consistency and therefore I have simmered it. 7. Garnish with cashews and raisins. Serve the kadle bele payasa or chane daali paays cold or warm. Never tried this type of kheer before, looks yummy! hmmmmmmmmmmm tempting lip smacking payasam. rich dal payasam looks super awesome dear..
looks mouthwatering.I never add rawa.Next time will try your recipe. wow!yummy and looks creamy and rich!